Home → Blog → Shipbuilding – Where Did They Build These Ships? Shipbuilding – Where Did They Build These Ships? Where did they build these ships? 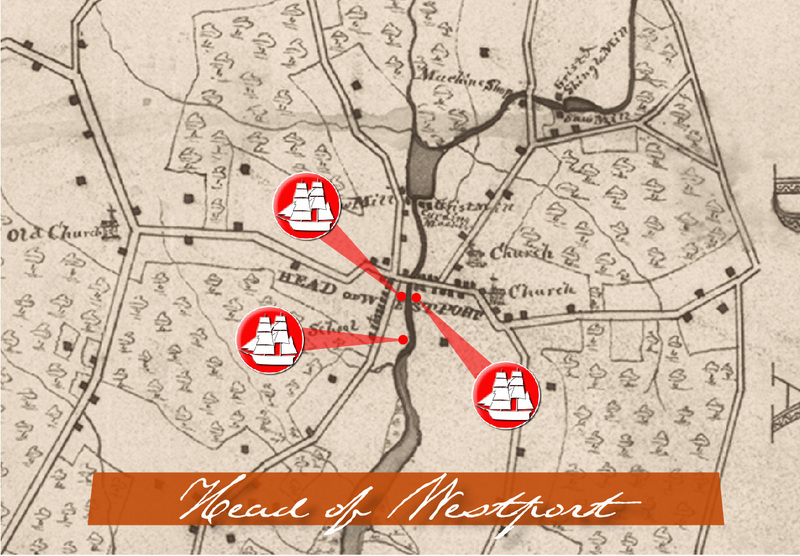 There appears to be very little documented evidence of exactly where early boat building took place, it is easy to surmise that many locations along the inland waterways around Westport were extremely well-suited to the building and launching of virtually any sea-going vessel. On either side of the landing, south of the current bridge on Old County Road was an ideal location for shipbuilding. Bordered by abundant forests, the gentle sloping riverbanks, direct water access plus an east-west highway and skilled manpower, convenient saw mills, foundries and blacksmiths shops complimented the Head’s shipbuilding activities. Along with this location, there is evidence that the riverbank just south of the Stone House may have been a shipbuilding yard. In its hay day between 1805 and 1828, five whalers are documented to have been built at The Head. Phebe Ann was a moderate size 200 ton ship built by Thomas Winslow around 1805. It is documented to have conducted eleven whaling voyages to the Pacific and Hudson’s Bay out of New Bedford between its launch and its apparent retirement from whaling around 1829. It is said to have been the only known ship to have been built on the east landing at the Head of Westport. President – There is some confusion regarding the nearly ninety-year life of this vessel, as it appears to have had two. 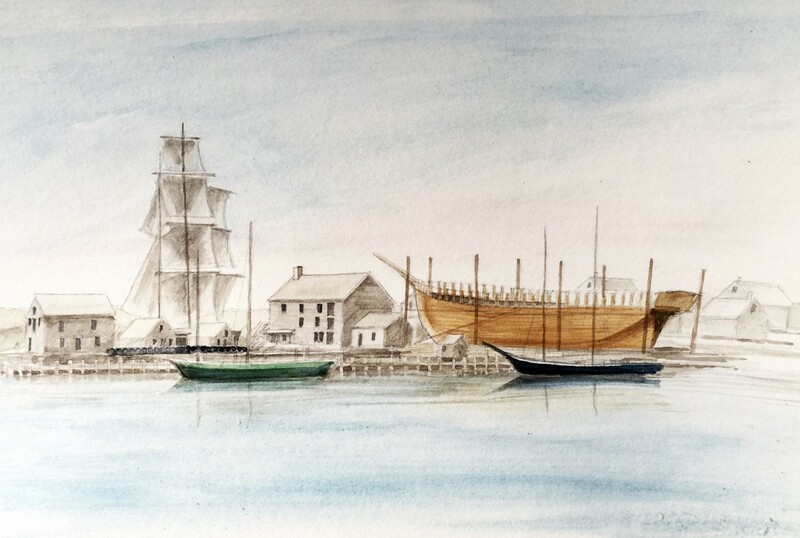 First as a 81 foot, 180 ton schooner (built at The Head by Andrew Hicks around 1815), then after a thirty-year career comprised of twenty-six documented whaling voyages, the vessel was condemned in 1848 only to be broken-up and rebuilt, and registered as the President II in Westport (or Mattapoisett) as a brig in 1849. Sailing out of both Westport and New Bedford, the vessel went on to amass another twenty-five whaling voyages to the Pacific and Atlantic before being lost off the coast of Africa in 1904. Further investigation is required to confirm the exact history of what would appear to have been a remarkably successful ship. Iris appears to have been the largest ship built at The Head. A 99 foot 311 ton ship built by Edward Jones 1818, the Iris conducted fourteen successful whaling voyages out of New Bedford to the Pacific and Indian Oceans before being lost near Port Gregory on the western coast of Australia in 1855. The Nye didn’t fair much better than Iris in its short but productive sailing career. As a 87 foot 214 ton ship built by Tabor and Tucker in 1827, the Nye conducted fifteen whaling voyages out of New Bedford and Dartmouth to the Pacific and Atlantic before succumbing to the same fate as the Kate Cory; burned by the rebel steamer Alabama off the coast of Brazil in 1863. Thomas Winslow was the last known whaling vessel built at the Head of Westport in 1828. A 75 foot 139 ton bark built by Thomas Mayhew, the Winslow conducted thirty-three documented whaling voyages from Westport Point to the south Atlantic and coast of Africa before being lost at sea in 1869. This might be the “Thomas Winslow” being built on the west landing at The Head with the Thomas Winslow house on the eastern side of the bridge. Shipbuilding activities seems to have been well established at Hix Bridge and all up and down the Noquochoke (East Branch of the Westport River) in the 18th Century. The gentle sloping riverbanks, direct water access to and from The Point, east-west highway access across Hix Bridge and acres of hardwood forests made this a logical location for the shipbuilding trade. Under close investigation, many references to ship building activity seem to be in evidence today. 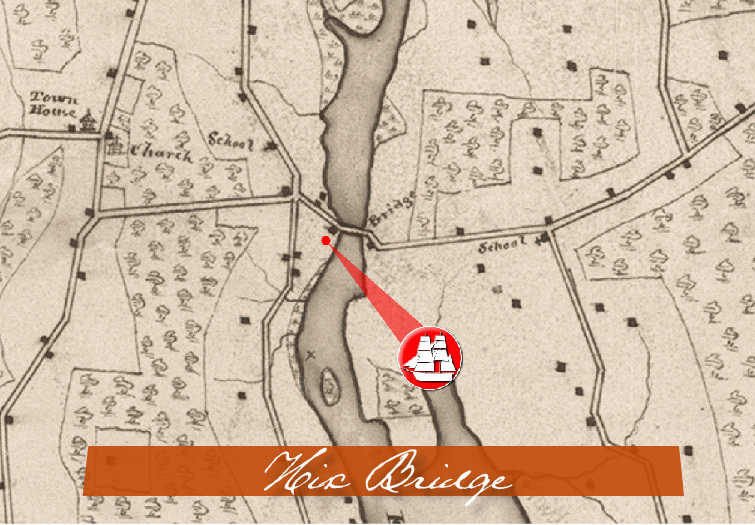 Between 1795 and 1803, John Avery Parker partnered with Lemuel Milk to build ships at the Head of Westport, then in 1804 after the partnership was dissolved, Parker joined forces with Levi Standish and Joshua Brownell and purchased William Hix’s bridge and both sides of the river at the current location of Hix Bridge. Parker is said to have built or partnered in the creation of no less than fifteen seagoing ships at this location. One can just imagine the bustle of activity that took place in this location as all of the resources of Parker, Standish and Brownell came into play during that decade. Mercator was an 88 foot 245-ton ship built by Parker and Standish around 1806 and conducted seventeen successful whaling voyages between New Bedford and the Pacific before being condemned in Paita, Peru in 1856. Phenix was an 110 foot 423-ton ship built by Philip Anthony in 1810 and conducted thirteen whaling voyages between New Bedford and the Pacific and Indian Ocean before being sold in Liverpool in 1863. Wilmington & Liverpool Packet was a 384-ton ship built by Parker and Standish around 1815 that conducted eight highly successful whaling voyages between New Bedford and the Pacific before being condemned and sold in Honolulu in 1844. Averick II was a 402-ton merchant ship built by Parker and Standish around 1828 with no apparent whaling record. Francis & Mary was a significant ship 355-ton ship built by Parker and Standish in 1815. It was a merchant ship with no recorded whaling history. More needs to be learned about the other vessels built near the bridge during this period. 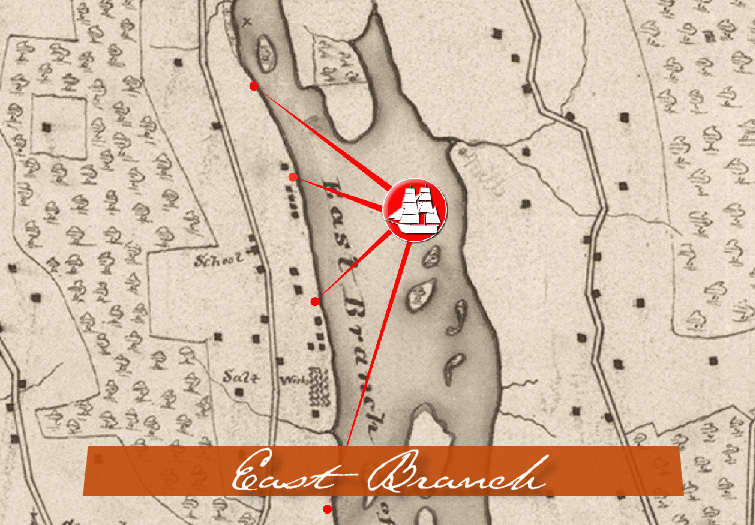 Between Cadman’s Neck and Great Island on the west bank of the East Branch, there is significant evidence of the seagoing trades in the 18th and 19th Century. Much of this activity appears to have predated shipbuilding activity at Hix Bridge. Paul Cuffe and the Tripp family were producing commercial schooners and whaling ships and initiating voyages from their shipyards. Evidence of the remains of significant granite piers can be found along these banks lending further credence to the theory that a substantial seagoing activity flourished in this part of town. These self-contained enclaves, just up river from The Point, had a significant deep draft channel that made launching and loading ocean-going vessels easier than up river. It is highly certain, it was from this location numerous Cuffe merchant ships including Ranger (launched in 1795), Hope (1795), Traveller (1806), Hero (1801), Alpha, were launched on their well-documented voyages to West Africa and beyond. Significant shipbuilding activities took place The Point in the 18th and 19th Century. As it is today, The Point was one of the well-established ports in southern Massachusetts and one of the most vibrant whaling communities in the country. Well-established wharfs and dockage area plus a sheltered harbor made it a perfect homeport. Many of the most successful whaling captains and ships made their home in this tricky little harbor. The Hicks’, Cory’s, Mayhew’s, Sowle’s, Davis’, Gifford’s, Peckham’s, Howland’s and many others made this port a prosperous hub during the whaling era. The area behind Cory’s Store (now, the Paquachuck Inn) was a perfect location for shipbuilding, and benefited from having a self-contained community of trades and craftsmen as well as a lumberyard and access to merchant schooners that supplied the local port. As a well-established port community with access to world markets, shipbuilding resources and chandlery, The Point was the logical hub of all shipbuilding activities. Most of the vessels that were built upstream were fitted-out at The Point. 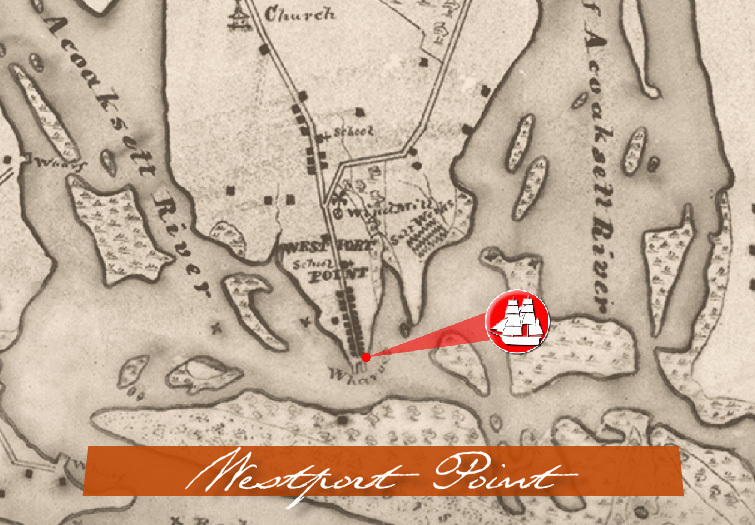 And, all ships leaving and entering the port of Westport found their home at the Westport docks. Rhoda – a schooner built by Alexander Cory in 1804 – Conducted four whaling voyages to the south Atlantic before being lost in 1812. Industry – a brig built by Jonathan Mayhew in 1815 – Conducted twenty-one Atlantic whaling voyages before being lost in the Gulf of Mexico in 1836. Columbus – a brig built in 1822 – Conducted twelve Atlantic and Indian Ocean whaling voyages before being condemned in Johanna, Mauritius in 1850. Mermaid – a 113 foot 326 ton bark built by Andrew Hicks in 1855 – Conducted eighteen Pacific and Indian Ocean whaling voyages before lost in Dutch Harbor, Alaska in 1899. Kate Cory – a 76 foot 136 ton schooner built by Alexander Cory in 1856 that was soon converted to a hermaphrodite brig, to improve its whaling effectiveness. Its whaling career was shortened to five voyages before being burned by the Alabama off the coast of Brazil. 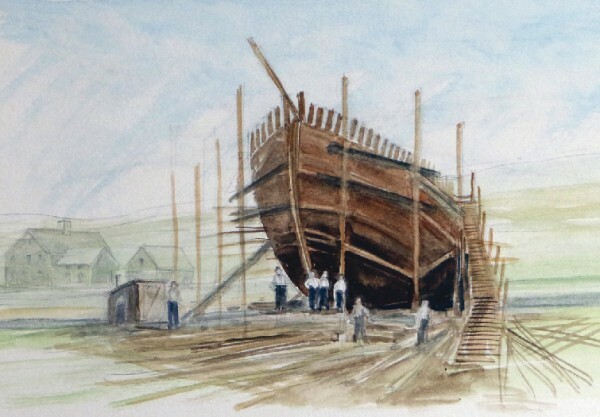 While ships were preparing for or returning from voyages at Westport Point, a significant number of new vessels were being built or ‘fitted-out’ behind Cory’s Store. (the current Paquachuck Inn) in the 18th and 19th Century. In a future post, we will discuss the innovative ways Head of Westport shipbuilders launched their vessels and portaged Hix Bridge. This entry was posted in Shipbuilding.